Ever since the iPhone was released, a common feature request has been custom ringtones—the ability to use a song or other audio file as your ringer. Apple recently introduced a new version of iTunes that lets you create ringtones out of (certain) songs you’ve purchased from the iTunes Store, but the cost to do so is an additional $0.99 over the cost of the song itself. And you can’t use this new feature to create a ringtone out of any other audio file in your iTunes library or on your computer—for example, tracks ripped from CDs you’ve purchased, open-source sounds from the Internet, or even music you’ve created yourself in GarageBand. What if you do want to use a particular song you’ve already purchased—through iTunes, on CD, from eMusic, etc.—that’s not available as an iTunes ringtone? What if you refuse, on principle, to pay for a song twice just to use it as a ringtone? Or what if you just want to use a sound or song you’ve created, or one that’s not protected by copyright, as your iPhone ringer? According to Apple, you’re out of luck. But that’s not quite true. A number of techniques for getting around Apple’s restriction have been publicized. Some involve hacking your phone with Installer.app; some try to fool iTunes into thinking that a track is an “official” ringtone by changing file extensions or editing ID3 tags. And Rogue Amoeba even created a free utility that automates the latter methods for you. iToner is simple to use. Launch it and connect your iPhone to your Mac just as you do when you sync with iTunes; iToner’s window—which is admittedly kind of cheesy; it looks like an iPhone floating on your screen—shows the name of your iPhone and how much space is available on it. Just drag the audio files you want to use as ringtones into the iToner window—standard AAC and MP3 files are accepted, as well as songs purchased from the iTunes Store—and then click on the Sync button. A few seconds later, the sync is finished and the new ringtones are immediately available in your iPhone’s Ringtone list. From that point on, whenever you connect your iPhone to your Mac and launch iToner, you see a list of all the audio files you’ve placed on the phone using iToner (built-in ringtones aren't listed; those purchased through iTunes are listed but grayed-out). You can preview a ringtone on your Mac by clicking on it in the iToner window and then clicking on the play button to the left. Clicking the delete button to the right will remove the song from the list—and, thus, remove it from your iPhone the next time you sync iToner. You can add new ringtones by dragging them into the iToner window; files that have yet to be copied to the iPhone display a sync icon to the left, and the Size Of Changes number at the bottom of the window shows the total size of changes that will be made to your iPhone’s contents. Since it is, indeed, obnoxious to use an entire song as a ringtone, I recommend using a utility such as Rogue Amoeba’s Fission (which we reviewed last December) to create shorter, ringtone-appropriate files—for example, the opening chords or the chorus of your favorite tune. You can also use GarageBand; when you’re done editing, use GarageBand’s Share menu to save the resulting files in AAC or MP3 format. (Note that you can’t edit protected music files purchased from the iTunes Store.) I also recommend naming your edited songs with a space at the beginning; if you do this, all your iToner-synced ringtones will appear at the top of the Ringtone list on your iPhone, with the stock ringtones at the bottom. Another benefit of iToner is that you can use any audio file in MP3 or AAC format, not just songs. For example, as TidBITS’ Jeff Carlson pointed out, if you’ve installed iLife ’08, there are a number of interesting MP3 sound effects inside the iMovie application package at /Applications/iMovie.app/Contents/Resources/iMovie ’08 Sound Effects . And over 1GB of sound effects and music snippets—although in AIFF format, which means they need to be converted to MP3 or AAC—can be found in /Library/Audio/Apple Loops/Apple/iLife Sound Effects , with even more hiding in the various folders containing GarageBand loops. If you prefer to use iTunes to manage your ringtones, click on the Advanced button in the iToner window, click on Sync With iTunes Playlist, and then choose a playlist to sync. (Note that if a playlist contains incompatible files—anything other than AAC and MP3—it won’t appear in the list. If all of your playlists are incompatible, then the option to sync with a playlist will be grayed out, as it is in the screenshot shown here.) The next time you sync iToner with your iPhone, iToner will sync the audio files in that playlist to your iPhone’s Ringtone list. If you use this approach, whenever you want to add songs or other audio files to your iPhone, or remove them from it, you do so via the playlist in iTunes rather than iToner’s list (although you still need to sync using iToner). Two features I’d like to see in future versions of iToner are a built-in ringtone editor, so you can drag a song onto iToner and trim it down to ringtone length right then and there, and a way to automatically convert your music files to low-bit-rate MP3 or AAC files; since ringtones don’t need to sound as good as a standard music track, you can save space on your phone by converting your custom ringtones to lower-quality files. One issue worth noting: some people who previously used iToner 1.0 have found that after updating to the latest versions of iTunes and iToner, syncing their iPhone with iTunes wipes out their iToner-installed ringtones. If you happen to experience this bug, quit iTunes and iToner, disconnect your iPhone, and then delete the file iTonerSupport.bundle in /Users/[yourusername]/Library/iTunes/iTunes Plug-ins . Make sure you’ve got the latest version of iToner, and then launch and sync iToner. Then launch and sync iTunes. Given that iToner isn’t free, many people are likely wondering what will happen if Apple updates iTunes or the iPhone in a way that breaks iToner. Ambrosia says that if that occurs, they’re determined to make iToner work again; however, if that proves impossible for some reason, the company told me they’ll try to find some way to address the situation—perhaps a credit towards another Ambrosia product—so iToner purchasers aren’t left high and dry. And don’t forget that Ambrosia offers a 30-day trial to test out iToner—and to see how it fares against the iTunes-update threat. If you want to use only one or two particular songs as ringtones (and iTunes actually offers those songs as ringtones), buying them from Apple is less expensive than purchasing iToner—not to mention easier, as everything’s done right in iTunes. 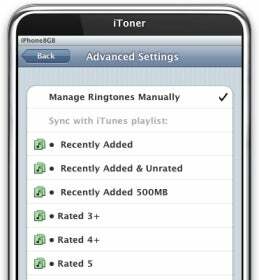 But if you want the freedom to change your custom ringtones whenever you like, or to use any audio file in your iTunes library as a ringtone, iToner is the way to go, and it pays for itself after only a handful of uses. iToner 1.0.2 requires Mac OS X 10.4.10 or later and is a Universal binary.